Participants gathered in the Shelby White and Leon Levy Reading Room of the LuEsther T. Mertz Library, NYBG. 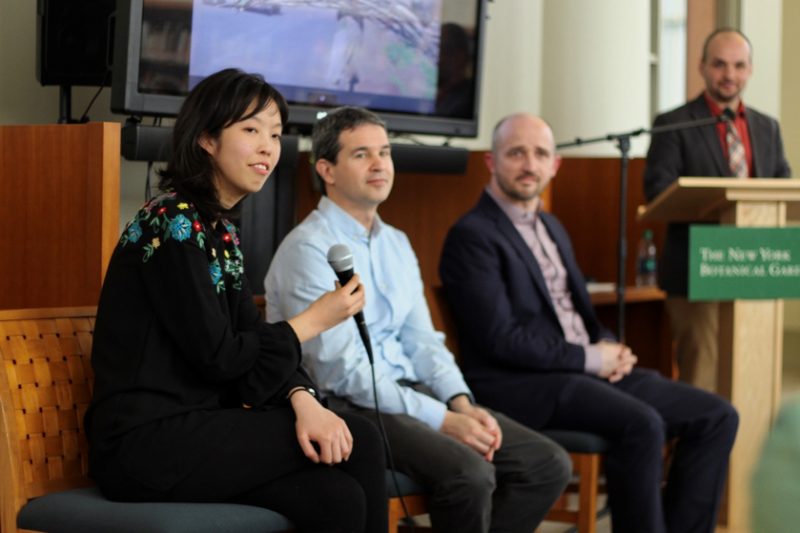 On Friday, March 24, 2017, the Humanities Institute hosted the Food, Tech, and the City colloquium, organized in conjunction with Fordham University’s Urban Consortium. The conversation began from a basic assumption—that we live in a time of rapid global urbanization and changing climate, and that these developments present unique challenges for the 21st century food system. The event also offered up a host of scientific and social innovations that could help feed the world in the years ahead. Featuring talks from two Fordham faculty members—from biology and economics, respectively—as well as a practitioner of urban agriculture and design, the event traversed from the seed to the field to the table, exploring case studies with relevance in both the developed and developing worlds alike. After introductions from Vanessa Sellers, the Humanities Research Coordinator at The New York Botanical Garden, and Garrett Broad, Assistant Professor of Communication and Media Studies at Fordham University, as well as short comments by Rosemary Wakeman, Professor of History and Coordinator of the University’s Urban Studies Initiative, a packed Reading Room in the Mertz Library turned its attention to the work of Steven Franks, Associate Professor in Fordham’s Department of Biological Sciences. An expert in plant ecology, Professor Franks’ talk on “Plants Adapting to Climate Change” began by explaining that our common understanding of Darwinian evolution—as a slow process of natural selection and survival of the fittest—does not tell the whole story. In fact, long-term research by the biologists Rosemary and Peter Grant—who focused on “Darwin’s Finches” on the Galapagos Islands—demonstrated that a quick shift from wet to drought conditions had caused certain finches to evolve large beaks in order to break the harder seeds that had developed. Their work showed that major environmental changes could lead to strong selection and rapid evolution—a finding that has clear implications in an age of climate change, with its increased temperatures and more severe droughts. Professor Franks continued by explaining his strategy for studying this topic in plant life—the “resurrection approach”—in which a contemporary seed is compared with its stored ancestor seed under common conditions. Through a series of experiments, Professor Franks and his colleagues have been able to identify genes in plants that allow them to adapt to climate change, through mechanisms like early flowering and pathogen resistance. The insights could prove crucial, he argued, to develop sustainable strategies for growing food and other plants in a warming and climactically uncertain world. The next remarks came from Andrew Simons, Assistant Professor in Fordham’s Department of Economics, who took on the topic of “Technology Adoption and Poverty.” He began by noting a set of staggering and somewhat surprising statistics: when it comes to preventable deaths around the world (afflictions such as malaria, tuberculosis, child and maternal malnutrition, and HIV/AIDS), the deadliest impacts are actually household air pollutants, which account for upwards of four million preventable deaths per year. To tackle this problem, Professor Simons has turned his attention to fuel-efficient cookstoves, which offer a cleaner option for households in the developing world than the traditional open-flame wood-burning stove. Envirofit—a leading manufacturer of fuel-efficient cookstoves—reports that its product reduces harmful gasses by an average of 50%, reduces biomass fuel usage by an average of 50%, and reduces cooking time by up to 50%. Yet, as Professor Simons argues, the technology alone has not been enough to fix the household pollution problem, with existing studies showing that the adoption rate among local community members in the developing world has remained extremely low. It begs the key question: how can these adoption rates be improved? Could a free trial, or perhaps the ability to pay for a stove in multiple payments, do the trick? Working with a team of researchers in Uganda’s national capital of Kampala, Professor Simons designed a study to test out these hypotheses. The results were striking. In the baseline group—that is, those households that were simply offered a chance to pay for the fuel-efficient cookstove in cash—4% of the people decided to buy it. When offered the chance to purchase using multiple payments over time, that number increased to 26%. For those given a free trial to test out the stove, 29% purchased the product. And for those who were given both a free trial and the chance to purchase in multiple payments, the number rose to a staggering 46%. A similar study was conducted in rural Mbarara with similar results—the free trial and time payments boosted from a baseline of 5% all the way up to 57%. Professor Simons insisted that, when policymakers and donors introduce a potentially helpful new product into the developing world, they must understand that the technological innovation will not work in isolation. Instead, social aspects like information and economic ability will always help shape the decision-making processes of everyday people, and that recognition must be built into any intervention program. A final presentation on “Urban Agriculture and Vertical Farming” came from Elaine Kung, a designer with Blue Planet Consulting and Agritecture (Blue Planet Consulting | +Farm | Agritecture). Kung began with a few statistical observations. Notably, today’s global population of 7.5 billion will grow to 9.7 billion in 2050, with 80% of residents in cities. In order to feed this growing population using today’s soil-based agricultural methods, about 20% more land would be required, a land mass the size of more than half of South America. But what if we didn’t need any new land at all to grow more food? Elaine Kung offered vertical farming as a viable alternative. She argued that one acre of vertical farming can produce the equivalent of 10 to 20 acres of soil-based farming; that vertical farming reduces food waste during harvest from around 50% to just 10%; that 70–95% less water is used in efficient vertical farming setups, as compared to the traditional approach, and that vertical farming also has the benefit of reducing pesticides and re-localizing the food system. 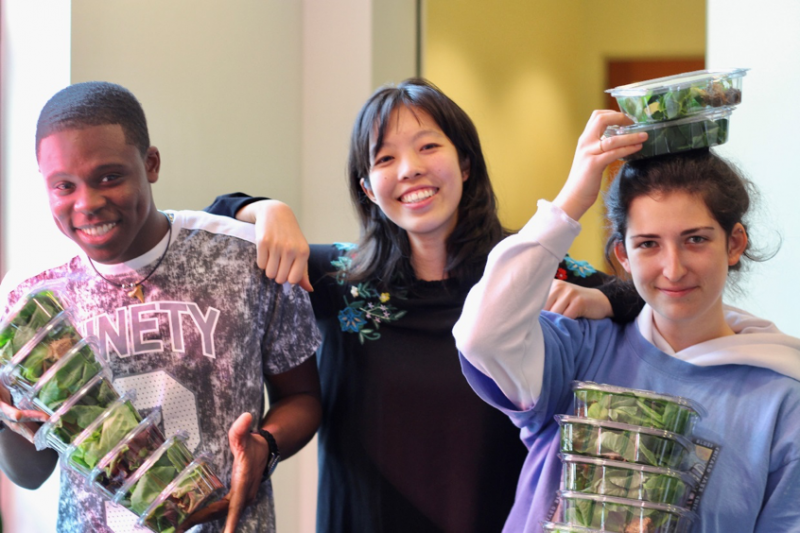 From there, she explained several different types of controlled environment agriculture (CEA), including hydroponics (using water), aeroponics (using air), and aquaponics (using water and fish). The only requirements in CEA include light, temperature, humidity, carbon dioxide, and nutrients, and there is great potential to integrate these systems into new forms of urban architecture and design. Not to be overly optimistic, however, Kung also noted the drawbacks—it requires high capital costs, labor, energy for lights, and has tended to focus on a limited set of crops that prove profitable. Yet the potential to improve and innovate these systems is clear, as made apparent by several urban agriculture projects right in New York City. These projects range from a community-based soil system in Battery Park, the Brooklyn Grange commercial rooftop project using engineered soil, Harlem Grown’s community hybrid, the Sky Vegetables commercial rooftop hydroponic system in the South Bronx, and the Aerofarms commercial vertical aeroponic system, among others. 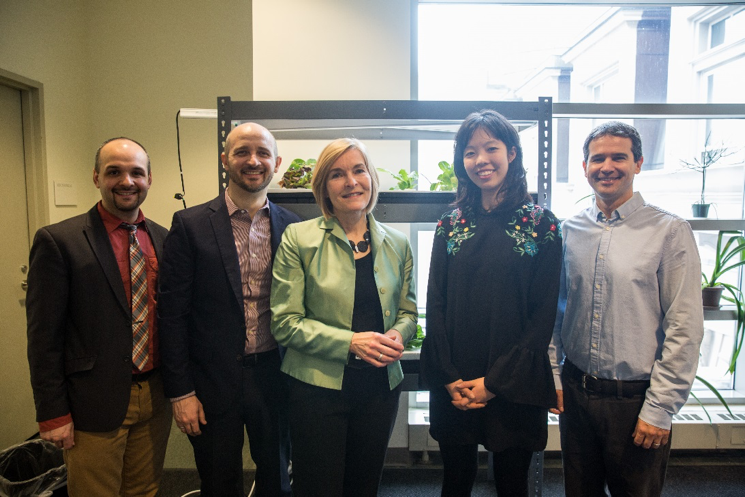 Ultimately, the future of urban agriculture can range from low-tech to high-tech, incorporating science and technology while also adapting to the needs and abilities of local communities. To cap off her presentation, and with the help of two student interns, Kung also presented a +Farm model, a DIY vertical farming system being developed by Blue Planet Consulting. A lively Q&A followed the presentations, as audience members and presenters together explored the intersections of science, technology, food, culture, environment, and urbanization. Taken as a whole, the event showed that there are indeed many problems embedded in our food system, challenges that we encounter in the plants themselves, in our growing practices, and in how we cook and prepare what we eat. But there is also reason to be hopeful that scientific innovation, guided by an understanding of the humanities and society, can lead us toward a more sustainable future. Summary by Garrett Broad, Assistant Professor of Communication and Media Studies at Fordham University. Photos and Edits, Vanessa Sellers, Research Coordinator, Humanities Institute, New York Botanical Garden.